← Rising food prices? See if you Can Outsmart That! Whenever I travel my eyes are open to new ideas that can transfer back home. I believe none of us have to re-create the wheel; we can borrow good ideas from other places and modify them for our best use. Having lived here in Oregon through my first winter now I observed on a number of farms how rain water is collected for later use in the dry summer. I had seen similar systems in West Virginia, where I used to live. Even through summer thunderstorms can provide a fair amount of rain there, they are not reliable and often crops can dry up by the end of July if not helped along. I was surprised, therefore, on a recent trip to India to see no rain water collection systems. Granted, I was traveling along main highways in one small section of the country, but I saw farmland and I understood that the rain is generally seasonal during the monsoons and much of the rest of the year is dry. I must not have described the ease of rain water collection to my tourguide well, and he must have not experience out of the city environment, because his immediate response was it would be too expensive. Yet since I saw many plastic barrels similar in size, I know and you know it is a feasible concept. Why a culture that has been active for 5000 has no irrigation system in that region is unknown. 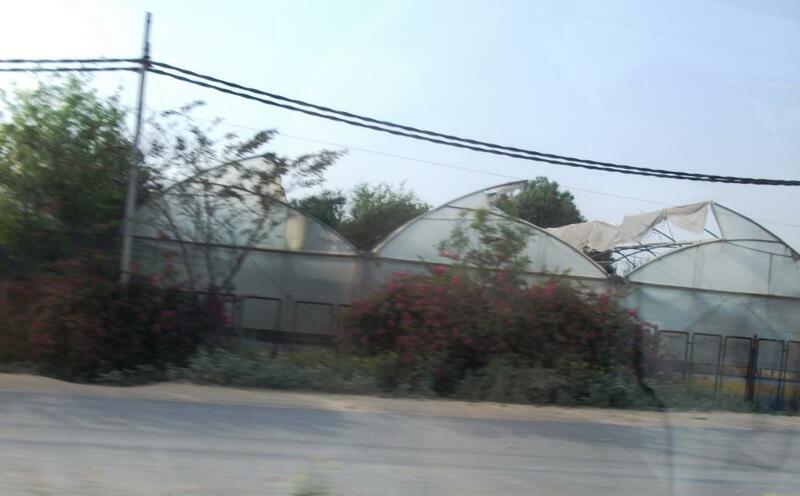 Something I did see that might intrigue you, however, is the one high tunnel I noticed as we drove by on the highway. I could not see what is growing inside at this time, but it looks like a bush. The temperatures during the week I was in India were in the 80-100 range and I thought the roof venting system was superb! Why would this interest you? Because you are either a consumer and would love to have fresh local produce year round or you are a producer and you would love to have increased income. High tunnels are not used here in Oregon as much as I saw in West Virginia, which makes sense because of how the winter conditions typically are, but it sure would make more cents for Oregon farmers to have a higher reliable production level in the winter. This entry was posted in farm, high tunnel, land use, Local food, local food stystem, season extension and tagged consumer interest', farm, high tunnels, local farms, Local Food, season extension. Bookmark the permalink. So with you on this. We could definitely stand to extend our growing season. My CSA doesn’t start up until the first week in June. When I have discussed season extension systems with the local farmers I hear lots of objections. The main issue is that they do not understand there is a market. The rest is just logistical stuff that can be overcome with a workshop.